Recover from the busyness of the holidays and enjoy a Smoky Mountain vacation in luxury from one of our newly renovated condo rentals in Gatlinburg. The lovely WindSwept 211 Suite is situated with an incredible vista of the Smokies and with all the modern amenities you need for time away with your loved ones. Plus, Gatlinburg condos are much more affordable than you might think. While there are many options for condo rentals in Gatlinburg, this Windswept Suite has been remodelled and is a luxurious option for a Smoky Mountain getaway. The view from the living room is breathtaking and is sure to be a highlight of your stay, with wall-length windows so you can take in the panorama. You may want to keep your eyes on the view all day in this wonderful room, which features a comfy wrap-around leather couch. Throw a few logs on the fire and listen for owls in the woods as the fireplace glows and crackles. This cozy condo has three queen bedrooms, making this a great spot for couples or friends to get away for some bonding. With two air mattresses for the kiddos, it can double as a family getaway, as well, plus the two bathrooms ensure everyone will have room. With a full kitchen, staying in Gatlinburg condos is more affordable than you think. Rather than staying in a hotel without the option for staying in for meals, this suite means you can gather round for a hearty breakfast and pack a picnic and some snacks. Enjoy dinner at one of the many restaurants in Gatlinburg or gather everyone round the dining room table and stay in. 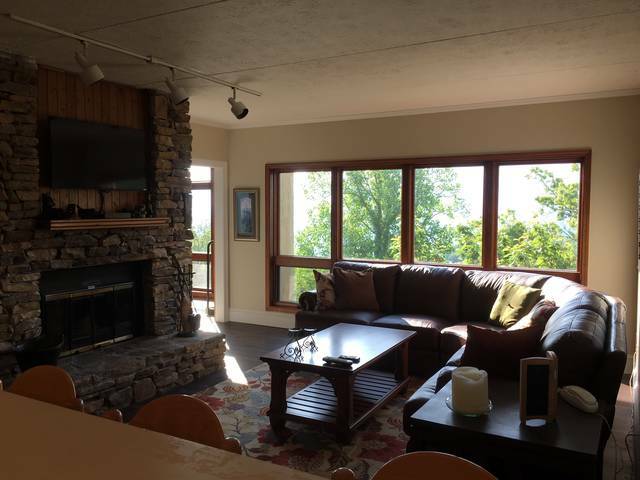 This condo is part of Chalet Village on Ski Mountain, offering close access to winter activities in the Smokies, plus shopping and dining in Gatlinburg. It is also handicap accessible and set on one level, making it easier for the whole family or group to get together. Make a day of it in the Great Smoky Mountains National Park, which offers far more opportunities for winter fun than you might think. There are more than 150 trails covering over 800 miles, including the Appalachian Trail, plus jaw-dropping views of America’s most popular national park. With snows often blanketing the upper levels of the Smokies for much of the winter, the opportunities for cross-country skiing and snowshoeing are varied, with plenty of choices for beginners. Gatlinburg itself, only minutes away from you, offers slopes for skiing, snowboarding, or snow tubing. It also has shows, amusements, dining, shopping, and more. Make sure to check out our specials for December, which include three nights for the price of two or 20 percent off your entire stay.